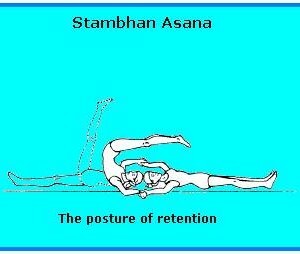 This asana is practiced by two persons together. Both lie on their backs with the crown of their heads in contact. They stretch both arms sideways and hold each others’ hands at arms length. The arms are tensed and the heads press each other. One person raises his legs to a vertical position. After a few seconds he lowers the legs and then raises them again, this time horizontally over his partner’s head. After a few seconds he lowers the legs and relaxes. Each person should practice a maximum of 5 times. Retain while raising, holding and lowering the legs. The breathing pattern is identical for both persons. 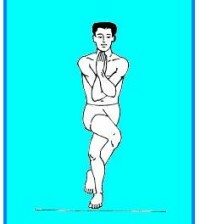 The first stage where the legs are raised vertically may be practiced simultaneously by both persons. Should not be practiced by any infirm person. This asana strengthens the arm and back muscles. It provides abdominal stimulation which activates intestinal peristalsis.